The polar vortex has cased Niagara Falls to freeze over once again as frosty temperatures chill Canada and America. 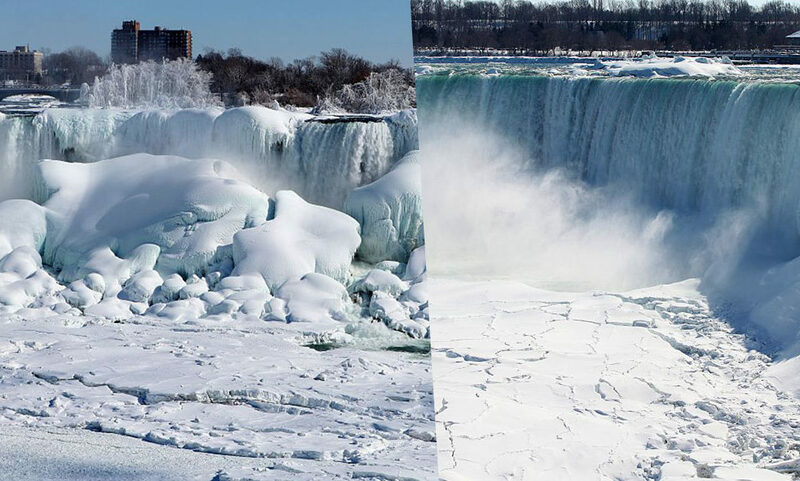 The Niagara Falls waterfalls lie on the border between Ontario, Canada and New York, America, with the temperature there currently being -1° fahrenheit, according to The Weather Channel. Breathtaking images show how the falling water has turned into large chunks of ice at the tourist attraction, thanks to the sub-zero temperatures. The American, Horseshoe and Bridal Veil Falls, which are collectively known as the Niagara Falls, appear to be completely frozen, covered in ice and snow. In fact, the water is still flowing. Prior to 1964, ice could block the flow of water further up the river, reducing the volume of water on the US side of the Falls to the point of freezing. This happened five times before steel ice-booms were added to prevent large collections of ice. More recently, the frozen effect you’ve seen is similar to any other river or lake that freezes. Surface water and mist in the air turns to ice, but there is still plenty of water flowing. The volume of water that makes up Niagara Falls combined with the constant movement of the river makes a total freeze nearly impossible. What makes the ice build-up so dramatic and beautiful is that water can freeze as it’s going over the falls, creating a large collection of ice below that can be well over 40 feet thick. This phenomenon leads to the amazing ice formations you see pictured. If you look carefully though you’ll see that sections of the falls are still flowing like usual. The website adds this spectacular event ‘is common’ every winter, with the extent of the ice build-up depending upon how long the sub-zero temperatures last. Tourists are only able to take photos like the ones they are taking right now, when the temperatures have dropped below zero for ‘long periods of time’. Niagara Falls USA urges tourists not to walk on the ice, although that used to be an attraction 100 years ago. Ice over a rapidly moving body of water like you’ll find at the base of the Falls is very unsafe. Almost a century ago, people were allowed to walk on the ice bridge and it became a regular part of the attraction in winter, however that changed when three lives were lost due to breakage in the ice. The website did share their top tips on how tourists can best enjoy a day out at the frozen falls. They recommend you wrap up warm and get there at around 8am in the morning to avoid peak times and crowds. When you arrive, Niagara Falls USA suggests you visit the iconic Niagara Falls State Park sign first, before heading over to the waterfalls themselves. If you fancy an adventure, you can zoom down the rapids in a jet boat, which run even in harsh winters such as the one the US is currently experiencing.